Is it possible to taste literature? A literary and culinary exhibition recently held at Moscow's Tsaritsyno Park tried to find out as chefs and culinary experts reconstructed old recipes used by great Russian authors and their characters. RBTH looks at two of the dishes featured at the exhibition. Despite his frequent stomach complaints, writer Nikolai Gogol did love his food. In his great comic novel Dead Souls, he gives a detailed description of a luncheon the main character Chichikov is treated to by economical landlord Sobakevich. "...Approaching the table, they consumed the customary glass of vodka (accompanied by sundry snacks of pickles, cucumber and other dainties) with which Russians, both in town and country, preface a meal… 'My dear, the cabbage soup is excellent,' said Sobakevich. With that he finished his portion, and helped himself to a generous measure of niania - the dish which follows shchi and consists of a sheep’s stomach stuffed with buckwheat porridge, brains, and legs. "To the shoulder of mutton there succeeded, in turn, cutlets (each one larger than a plate), a turkey of about the size of a calf, stuffed with eggs, rice, and liver." The modern stomach is unlikely to cope with such a sumptuous meal, but the recipe of the shoulder of mutton with buckwheat porridge has been restored. 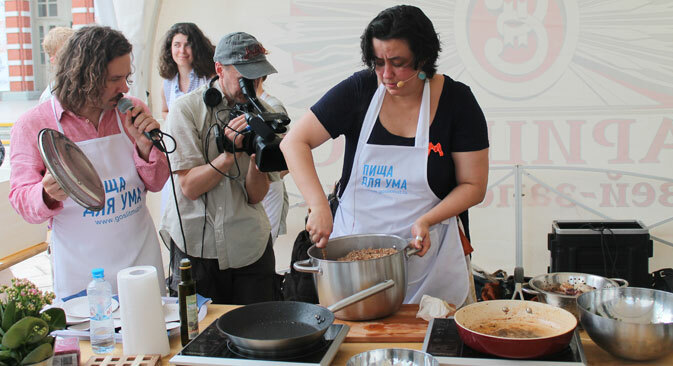 Marianna Orlikova, deputy editor-in-chief of Gastronom magazine and cookery book author, tried to prepare this dish without the traditional Russian stove. First, you boil buckwheat in a saucepan, adding salt. Then you add to it finely chopped onion, close the lid (if the saucepan has ventilation holes, fill these in with beads made of flour and water) and put it in the oven, pre-heated to 100 degrees, for an hour. This creates the same effect as a stove. Add butter, preferably melted butter, to the buckwheat: one tablespoonful of butter to one glass of buckwheat. Grill the mutton in a pan without butter. Pierce the fatty bits in several places for the fat to pour into the pan. Add salt and pepper to taste. Add the buckwheat to the mutton, add meat juice and roast until ready. The same recipe features in Ignaty Radetsky's Gastronomer's Almanac (1877). He learned to cook in France and later served as headwaiter or head of kitchens at the court of His Imperial Highness Duke Maximilian of Leichtenberg, at the St. Petersburg Noble Assembly, and for princes Paskevich and Wittgenstein. In his Almanac, Radetsky collected 30 court meals, or 330 recipes for various dishes, "both expensive and cheap," as he put it. However, one should not think that everybody in the 19th century was eating shoulders of mutton or turkey, like Gogol's characters, all the time. In fact, meat was rather scarce. When an animal was killed, the meat was cured, processed into sausages and so on, with only a small portion of it consumed straight away. The most common food was in fact vegetables and cereals. Another guest to the exhibition was Yulia Vronskaya, the author of the project "Ankovsky Pie, or Secrets of Estate Cuisine", which offers gastronomic tours, a gastronomic app about Sofia Tolstoy's recipes, literary menus, etc. She treated everybody to the famous Ankovsky pie, following a recipe by Leo Tolstoy's wife Sofia. The recipe originated from the family doctor Nikolai Anke. Legend has it that not a single festive meal in the Tolstoy household took place without that pie, which became part of the family history. "One pound of flour, half a pound of butter, a quarter pound of crushed sugar, three yolks, one shot of water. Butter should be straight from the cellar, cold. The stuffing: Grate a quarter pound of butter, grate two bolied eggs with butter; half a pound of crushed sugar, grate the zest of two lemons and add the juice of three lemons. Boil until it grows thick as honey." According to Vronskaya, despite there being a recipe book compiled by Sofia Tolstoy, one should not think that she spent all her time cooking. If memoirs are to be trusted, she cooked only when the family cook was drunk. There is an anecdote that quotes her as saying how much she detested a goose that she had roasted for three hours. Sofia Tolstoy liked to put down recipes in her book, but she seldom cooked herself.